Treat your locks to the Shu Uemura Art of Hair Essence Absolue Overnight Serum; a night-time treatment that delivers multiple benefits to facilitate morning hair styling. Infused with Japanese Red Camellia Oil, the lightweight, non-greasy serum softens and nourishes hair, whilst taming frizz and unruly strands to improve manageability from root to tip. 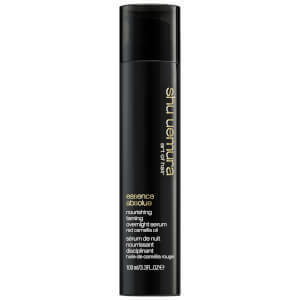 Prevents tangling and ensures tresses feel smooth, hydrated and rejuvenated come morning. Apply on dry or damp hair before bedtime. Spread a pump into hands and distribute the product evenly on tips. Adapt the quantity to suit hair length and thickness. In the morning, style hair directly. In case of contact with eyes, rinse them immediately. Aqua / Water, Cyclohexasiloxane, Cyclopentasiloxane, Ci 19140 /Yellow 5, Ci 15985 / Yellow 6, C13-14 Isoparaffin, Hydroxycitronellal, Phenoxyethanol, Polyacrylamide, Dimethiconol, Camellia Japonica Seed Oil, Isoeugenol, Laureth-7, Hexyl Cinnamal, Glycerin, Parfum / Fragrance. (F.I.L. C210606/1).